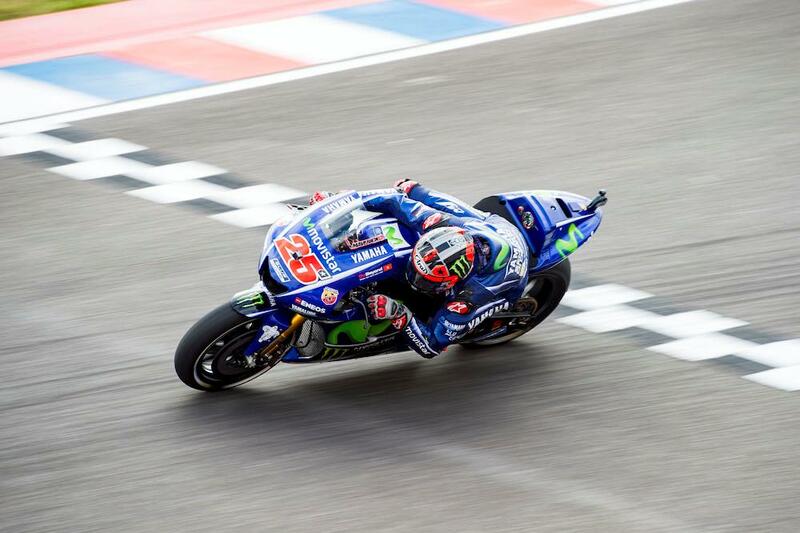 Maverick Viñales has displayed his second masterclass of the 2017 MotoGP season to take a superb victory in the Argentinian Grand Prix, after main title rival Marc Marquez crashed out of contention while leading the race and handing his fellow Spaniard his second win on the bounce. Marquez was an early leader, setting a blistering pace at the front to pull out a gap – but fell heavily as Viñales hunted him down, giving the Movistar Yamaha rider the second win of 2017 and setting himself up as the man to beat in the title race. Valentino Rossi rallied back from a struggling weekend in normal pace to hunt down and eventually overtake Crutchlow, who rode a strong race to third and top Honda for most of the race. 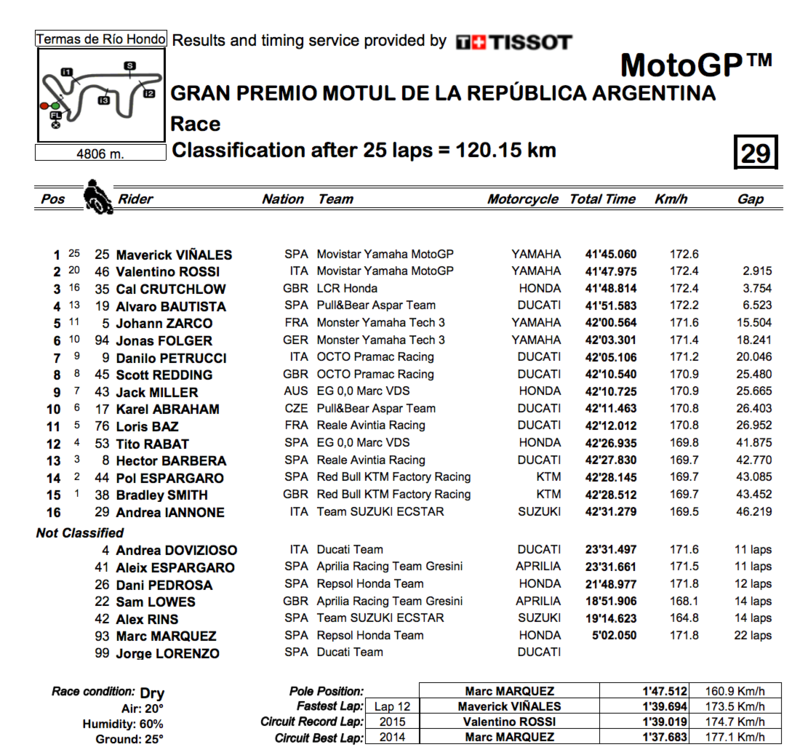 Behind them it was chaos throughout the race, with Alvaro Bautista emerging in a brilliant fourth on the Aspar Ducati, with Johann Zarco taking fifth in his first MotoGP finish just ahead of teammate Jonas Folger. However, there was many fallers from the battle, with Dani Pedrosa replicating teammate Marquez’s crash while Andrea Dovizioso was taken out for the second year in a row, this time by Aleix Espargaró. Jorge Lorenzo’s Ducati debut continued in shambles after making contact with Andrea Iannone on the first lap, falling from the race, only for the Suzuki rider to be punished with a ride-through penalty for a jump start. Scott Redding came home happy in eighth and Bradley Smith scored his first points on the KTM in 15th, while Sam Lowes retired with gearbox problems.